I have a printing error copy of Good Guys #2. It has a partially faded Jim Shooter page. Here's a pic that features both the error version and corrected version of the Jim Shooter page in Good Guys #2. I predict pictures on Saturday. LOL! That's a good prediction. I saw a note on one of them that said something like ''faded Jim Shooter page'' and a note on the other one that said ''correct Jim Shooter page''. So I opened them and noticed the error on the one copy. Corvette Jim must have discovered the error and put those notes on them. I think I already knew about this at one point. I don't usually track error comics. I don't either really, but it's part of Defiant history so I thought I'd document it here. 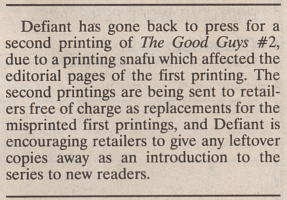 I guess I should check my other copies of Good Guys #2 to see if any others have that error. I thought of a way to get the pics posted here Saturday. If you want to edit that one of the printing error I posted that's cool Defiant1. Otherwise I'll take care of it this weekend. Three of my six copies of Good Guys 2 have the printing error. Any of you guys that have Good Guys 2 would you check what you have and post here if they have the error or not? Thanks. That's okay. Although it might still be a problem for smart phones, I reduced the width of the image. It's still the same large picture, I just changed the display size. If you click the image button and you know it's a large image, just put 500 or 600 in the first box when it asks for the dimensions. It will automatically proportion the height of the image. The first box adjusts the width. This is a notable difference. I think it's pretty safe to say that the page would have a blue background instead of white. I might actually list this, but I think I'll just make a note on the page for that specific issue so that Brother J doesn't get the inclination to strangle me for adding it to the checklist. If I get a chance I will. I need to consolidate some of my previously scanned magazines into the larger alphabetized set of stuff I have. This might motivate me to go downstairs and do that. I have to go down three sets of stairs to do that. Information on this has now been added to the site. Further links are available in the "News" section at the bottom of the main page (to see what was changed). I hadn't really done a close comparison of the error page and the corrected page in Good Guys 2. The entire error page is white, and the corrected page has a blue background. Pics to come. In my recollection, they should all be blue. The TPB collection some formatting differences, but I think it was blue also. I added a pic to the top post of this page that features both the error and corrected version of the Jim Shooter page in Good Guys #2. Awesome. You posted one picture early, but posting the second one make my plural "pictures" prediction accurate. Just noticed my pic is upside down. Lol. I'll have to see if I can adjust that later. I have a Firefox plugin that allows me to right click and rotate it clockwise (or counterclockwise) a couple of times to show it oriented correctly. It only changes the way I'm looking at it on my end of course. This was a nice opportunity to actually use the plugin. That photo in the top post looks correct now on my end too. I might need to flush my cache. It's still upside down for me. It's upside down again for me now. If I get a chance in the next day or two I'll try to correct it. I uploaded my photo to photobucket and posted a link to it in the top post. It's now right-side up. It seems blurrier now and maybe too big. Also, if my photobucket account ever goes by the wayside or my pics there get deleted this won't be preserved on this site. 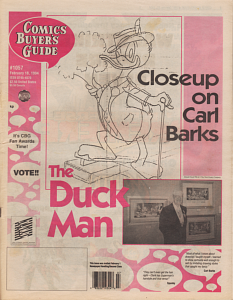 Looks blurry....I guess the white page doesn't show the JimShooter editorial pic either? I'll try to get a better pic and post it within the next week. Meanwhile, I'll have to check a copy of the book when I get home to see if the pic of Shooter is faded out but still showing lightly or missing completely. The two posts directly above this one are images I had uploaded to photobucket, and are here via photobucket links. Just checked an error copy of Good Guys 2. It completely omits Shooter's picture. The page should wrap around where folded and that side of the paper should appear at another place in the book. Is the printing error present elsewhere. It looks like that side of the paper only got black ink and it didn't get hit with the plates for Cyan, Magenta, and Yellow. What do mean is the printing error present elsewhere? Do you mean is it present on other pages? Yes. Elsewhere in the book. An interior sheet of paper should be printed with 4 pages on it. 2 pages on each side. Assuming the back side of the paper printed properly, there should still be another page in the book with a printing defect. I'll check and post my findings soon. Disabled the photobucket links in the threads. If I remember, I'll try to see if I can plug in some images so that this thread makes sense. Small image of the cover.